Why catch one bird when you can catch two? 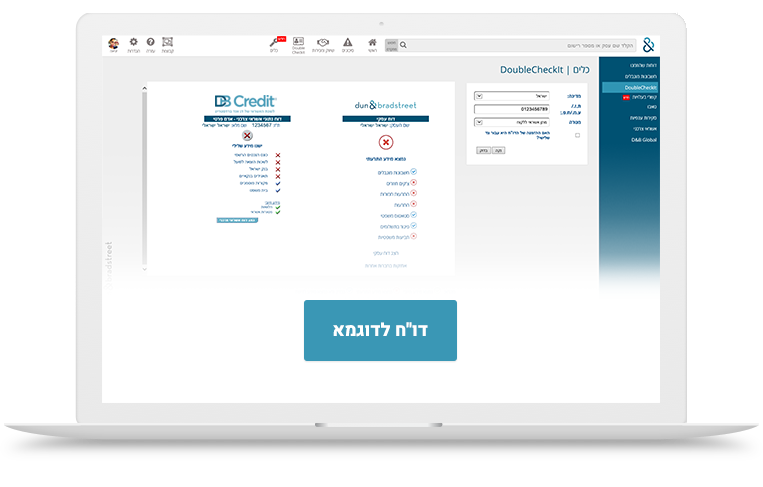 Double Checkit offers one comprehensive evaluation that presents the risk level and status of your customers and suppliers at both the company level and the personal level. In essence, with Double Checkit, you can determine whether the owners are drowning in debt even though their business looks fine. It’s important to know everything. The evaluation is based on data from both the Dun & Bradstreet’s business database and from the consumer credit database. Double Checkit provides an immediate and detailed picture of the licensed dealer’s or business owner’s status using a variety of official and state sources as well as bank and commercial sources. כשאתה לא יודע עם מי יש לך עסק אז תבדוק בדאבל צ’קאיט! Interested in Double Checkit ?